Cooking out of season is a little more acceptable on the west coast, where seasons are peripheral. Yes, it got a little chilly out here in L.A. in January and February; I was wearing long sleeves in March, but life didn’t change the way life changes so dramatically when it gets cold back east. So why not make beef stew in June? That was my philosophy when I unpacked Amanda Hesser’s mammoth New York Times Cookbook and discovered a recipe by that most fabulously ferocious food writer, Regina Schrambling, for Dijon and Cognac Beef Stew. 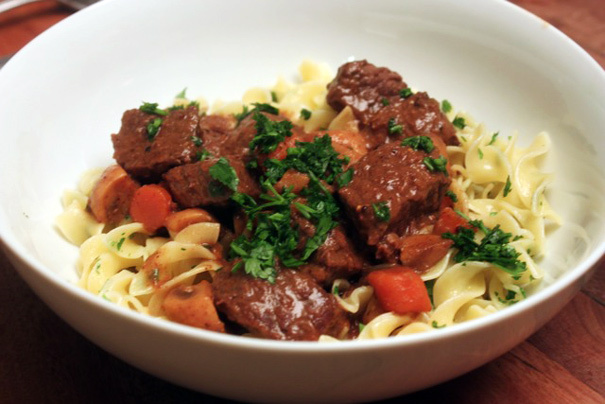 What I liked so much about this recipe is that it does to Beef Bourguignon what John Travolta and Eric Stoltz do to Uma Thurman in “Pulp Fiction”: stabs it in the heart with a hypodermic needle, though this one’s filled with mustard. Things got a little scary here because I was browning the beef in batches and the bottom of the pan was getting darker and darker until I was convinced it was black and going to make the stew taste burnt. But what could I do? I could do nothing. I finished browning the beef and moved on to the next step. 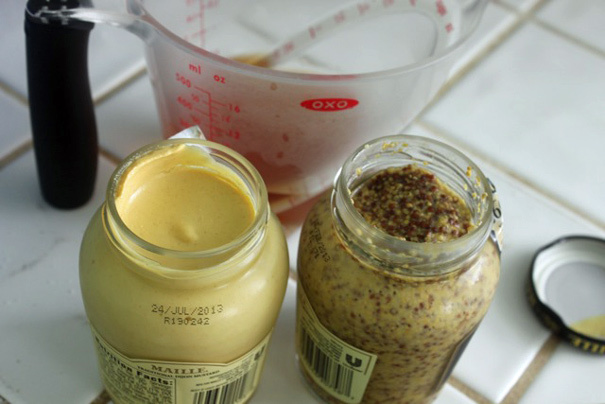 Observe: Cognac and two types of mustard. That’s a most curious feature of this recipe: the red wine goes in at the end. 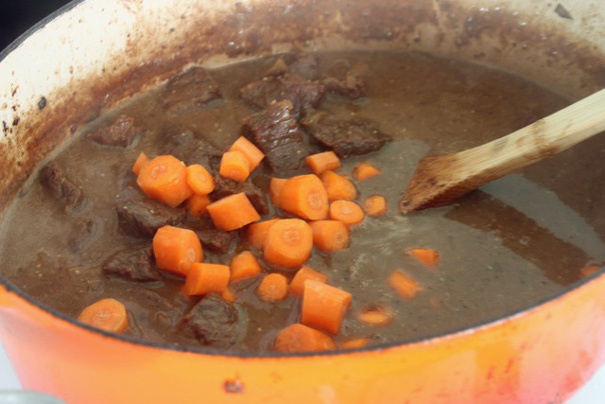 What I like about that is that the stew, which has deeply developed, dark flavors is brightened by the acidity of the wine. You can also stir in more mustard at the end, but I’d added it with a heavy hand earlier and didn’t need to do that. So there you go! Beef stew, out of season, stabbed in the heart with mustard. There are worse things. Summary: Adapted from Regina Schrambling’s recipe in The New York Times Cookbook. 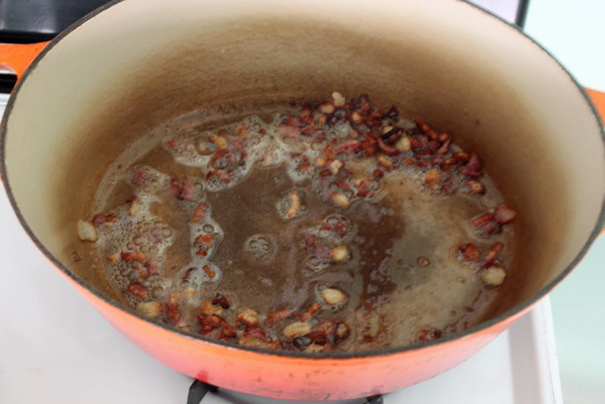 Start by rendering the bacon in a Dutch Oven on low heat (I add a splash of vegetable oil to help it along). 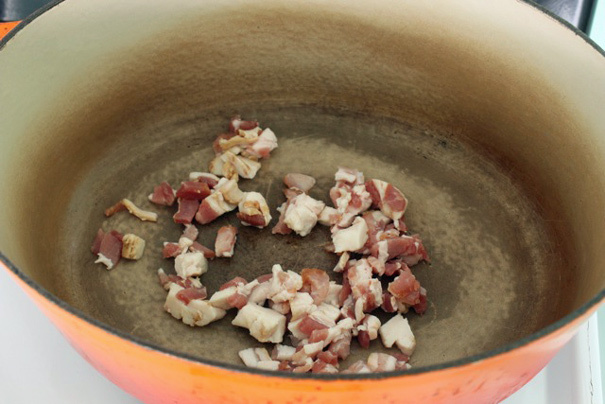 When it’s crispy and the fat is rendered, remove it from the pan and snack on it while you proceed. 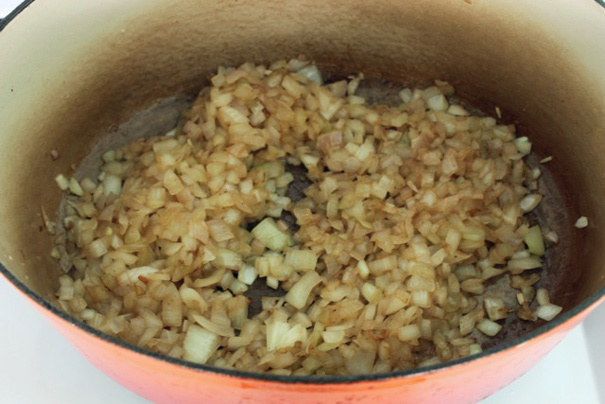 Raise the heat and add the onions and shallots, cooking them until they’re soft but not brown (10 to 15 minutes). Transfer them to a bowl. 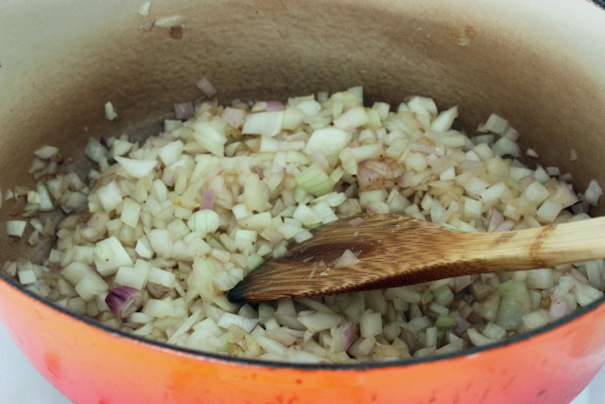 Even though it’s hard, make sure to get all of the onions out so you can brown the meat well without burning an onion piece. 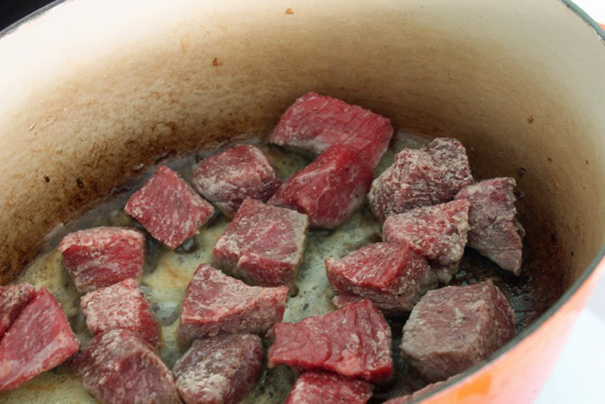 Add 2 tablespoons of butter to the Dutch oven and increase the heat to medium-high. 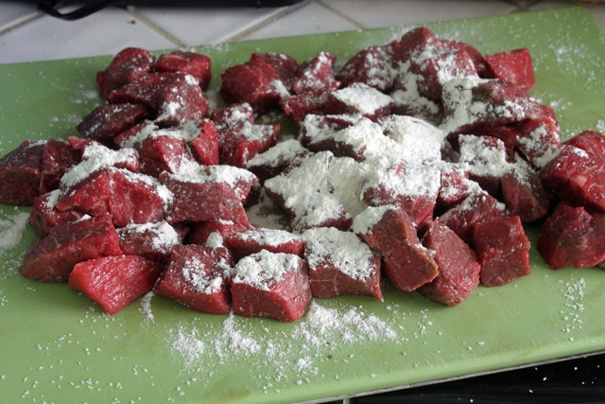 Season the beef cubes with salt and pepper, dust with flour, and then brown in batches. 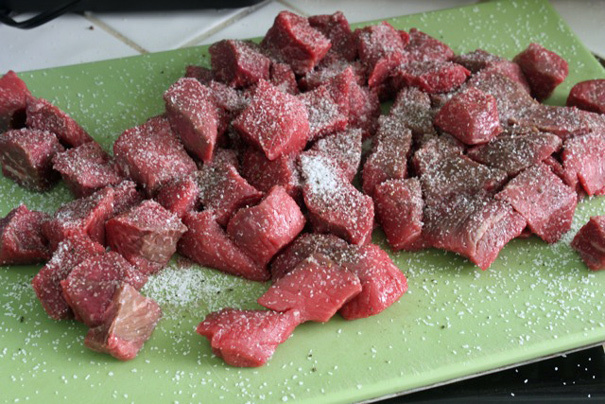 Make sure you get the pieces brown on all sides–this’ll give great flavor to your stew. 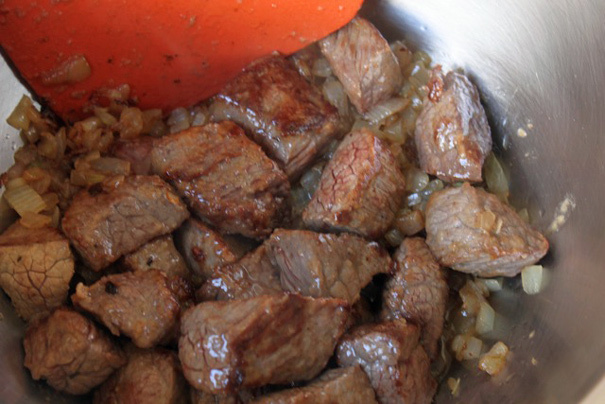 Remove the browned beef to the bowl with onions and repeat with the remaining beef. 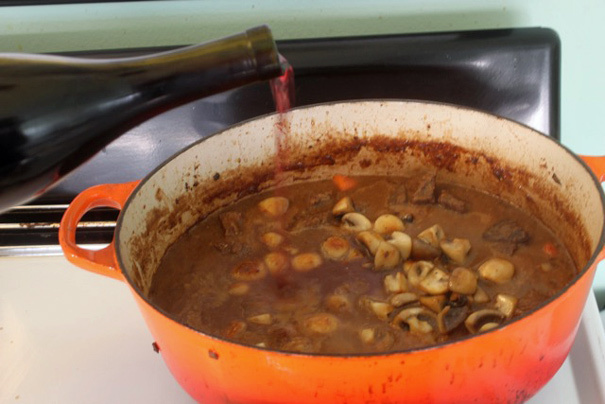 When all the beef is browned, add the Cognac to the pot (it’ll sizzle and bubble!) to dislodge everything on the bottom. If that amount of Cognac doesn’t do it, add a little more. 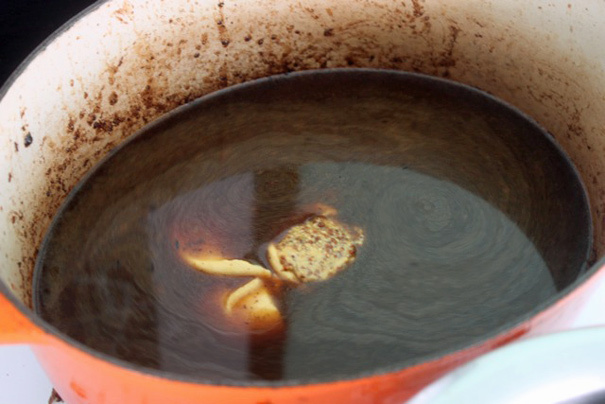 When the brown bits are worked up, add the beef broth, Dijon mustard, and 1 tablespoon Pommery mustard and whisk to blend; then return the meat and onion mixture to the pot. Lower the heat, partially cover, and simmer gently until the meat is very tender, about 1 1/2 hours. Add the carrots and continue simmering for 30 minutes, or until tender. 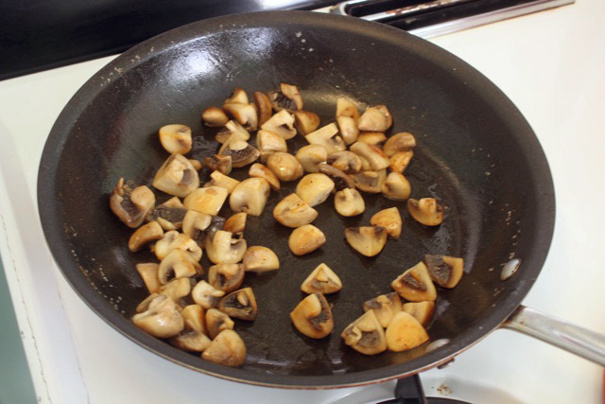 Meanwhile, melt 2 tablespoons butter in a medium skillet over medium-high heat, and saute the mushrooms with a pinch of salt until browned and tender. 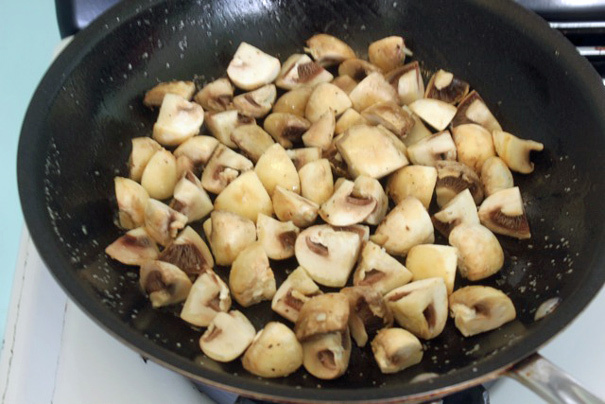 Stir the mushrooms into the stew, along with the remaining 3 tablespoons Pommery mustard and the red wine. 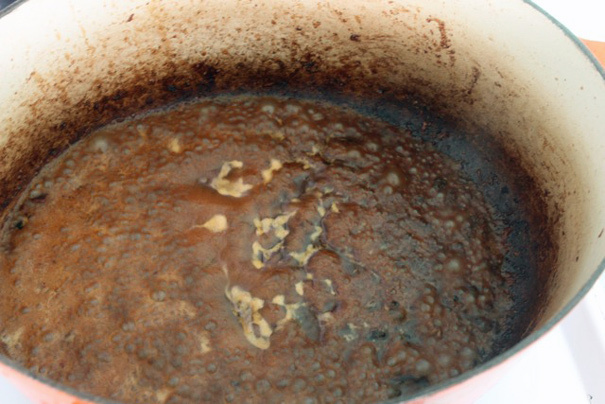 Simmer for 5 minutes, then taste and adjust the seasoning. If you’ve made stews before, feel free to play around here. 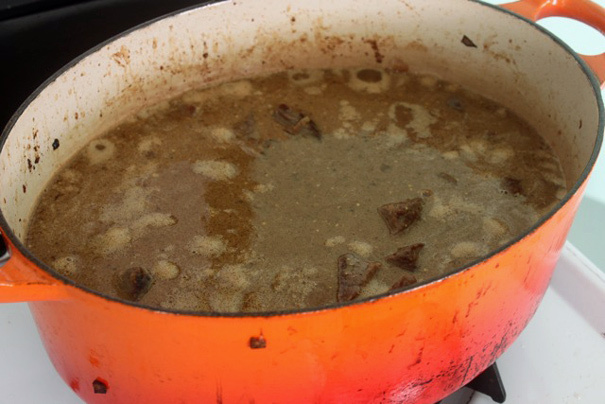 For example: I used more beef than the recipe called for (I was serving 6), adding more Cognac and beef broth and red wine and mustard based on my instincts. Also: add more butter to the pan as you brown the 2nd and 3rd batches of beef so they have enough fat to give them color.